When you were eleven, slumped in the back of the Methodist church, you stared at your father’s arm. It lay draped over your mother’s shoulder as if it belonged there, like a scarf or a stole. You won’t think of this again until you are twenty six, when a man drapes his arm across your back as he sleeps. His fingers tap the melody of songs about love and loss, the same songs that used to claw and tear at you in dreams. You no longer awaken with a start, checking your body for bruises and scars. Instead, lie awake and listen to the way your heart falls into pace with his. 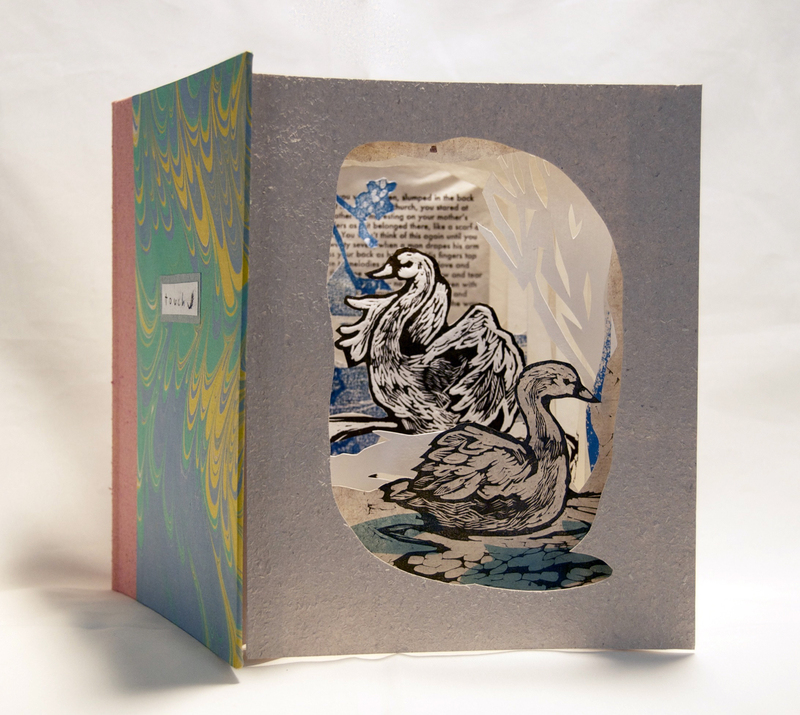 A parallel text ties this memory to mute swans. Unable to make sounds, these birds communicate solely through touch. Both Touch and The Barred Owl use text that originally appeared in a previous book called Migration: A Field Guide to Love that Was and Might Have Been. 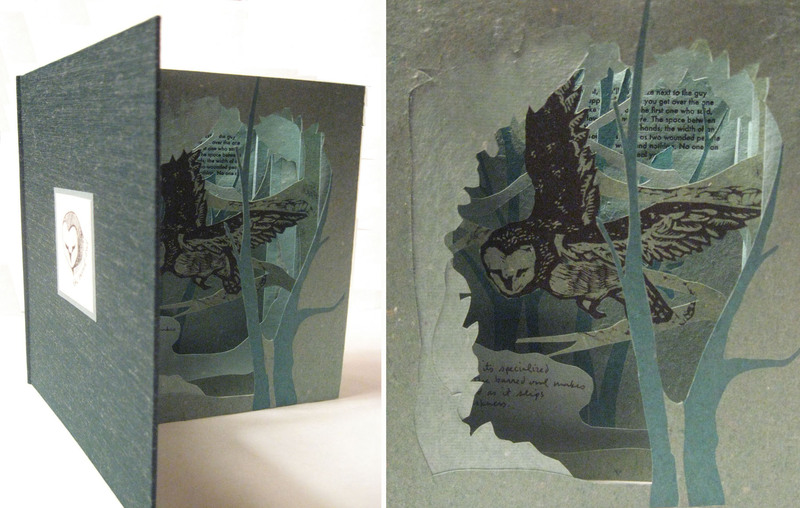 I had wanted that book to have a certain amount of transparency in the handmade papers–one that would allow more interplay and layering between the pages. After experimenting with the tunnel book form, I found that it could give me the kind of layering and depth that the original codex form could not. You struggle to keep scraps of your former self together as they splinter away from the woman you are becoming. Some days you feel like you’re held together only by stitches and scars, that too many moments are slipping away like smoke. You pick at the scars so you don’t forget, stitch yourself up with binder’s thread to keep the pieces from falling away. You fold your wishes into paper cranes, then touch them with a match and release them into the sky. Jelly, (above), started purely as a way to experiment with the tunnel form. I’ve always been fascinated by undersea creatures–especially those with tentacles. 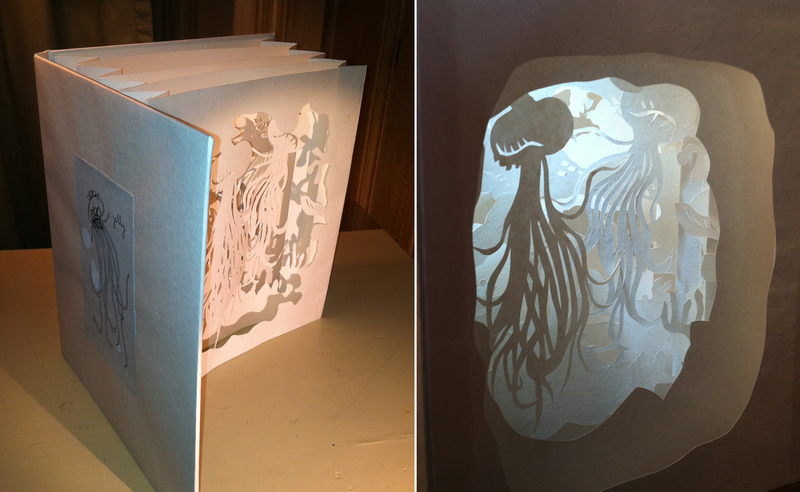 I wanted to make this book all in white and explore how light could create an illusion of depth. 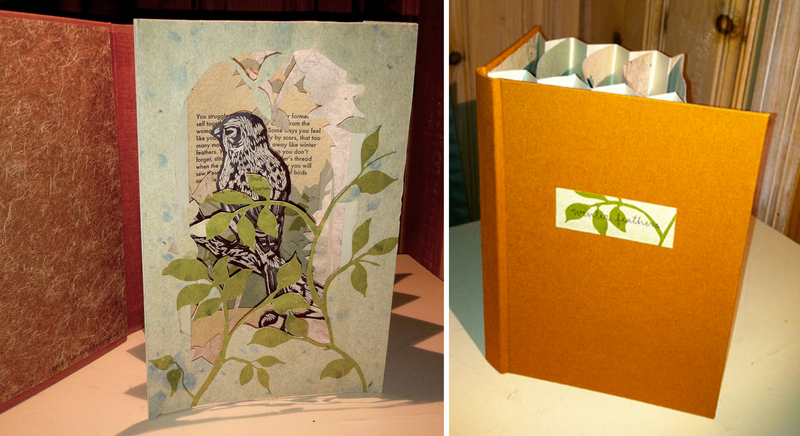 Made entirely of handmade paper, it is approximately 8″ x 8.5″, hardcover, and features an ink drawing on the front cover. The image on the right shows the addition of two panels in the front of the book. The finished tunnel includes six panels and extends to 12″. Edition of 1, 2014. $400.